While Belize is known for it’s abundance of adventures like exploring Mayan ruins, jungle tours, scuba diving, and cave tubing, to name just a few, my last trip there wasn’t very adventurous… by choice. Since my husband and I have traveled to Belize before, this trip we just wanted to “hang” and soak up some sun and culture. And we managed to do just that in our weeklong visit. Here are some of the “easy breezy” things we embarked on and I highly recommend. 1. Enjoy some fine Caribbean dining at The Smoky Mermaid in Belize City. The Smoky Mermaid is one of my favorite restaurants in Belize City. It is located at the Great House, an old colonial style guesthouse in the Fort Street Area in Belize. It is also directly across the street from the Radisson Hotel so we could walk there anytime for breakfast, lunch, or dinner. For dinner, we started off with a couple of Dandy Coladas at the bar. Then once seated we ordered a variety of appetizers like fresh ceviche and skewered shrimp, and split the Lobster dinner. But no matter what, we had to leave room for dessert since the fresh fruit plate with drizzled chocolate was just too good (and healthy) to pass up. 2. Spend a “No Shoes, No Shirt, No Problem” Day in Caye Caulker. The less developed and more laid-back island of Caye Caulker is one of my personal favorite places to experience “off the beaten path” culture in Belize. 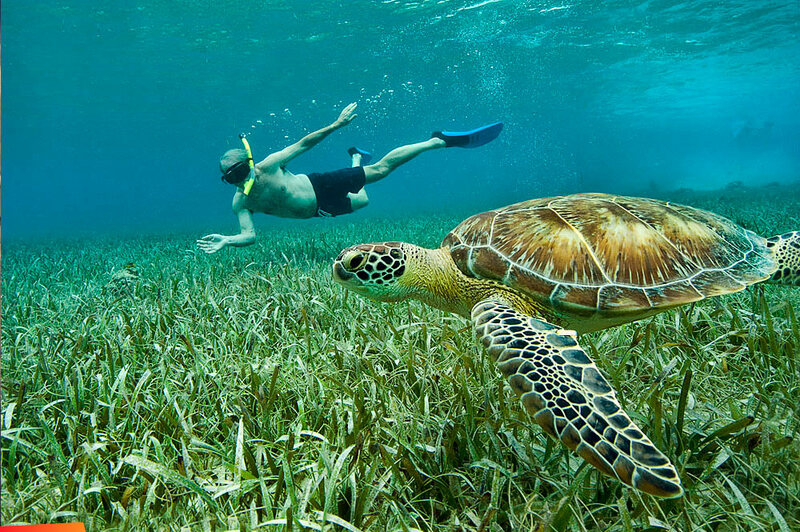 Caye Caulker is located approximately 20 miles northeast of Belize City and just a 40-minute jaunt by water taxi. We spent an afternoon there eating at one of the local restaurants on the beach and taking a lazy stroll through the town looking at all the crafts for sale and people watching. While waiting for our water taxi to come pick us up, we shared a hammock, took some selfies, and fell asleep under the breezy palm trees. While relaxing on the beach in Ambergris Caye, we spent an enthralling afternoon watching several pelicans go fishing. They would circle high, then dive headfirst to take their plunge under water and catch their lunch. It was a remarkable sight and very entertaining to say the least. We literally couldn’t stop watching them and lost all track of time during this pelican feeding frenzy. 4. Spend a Saturday afternoon at the San Ignacio Market. 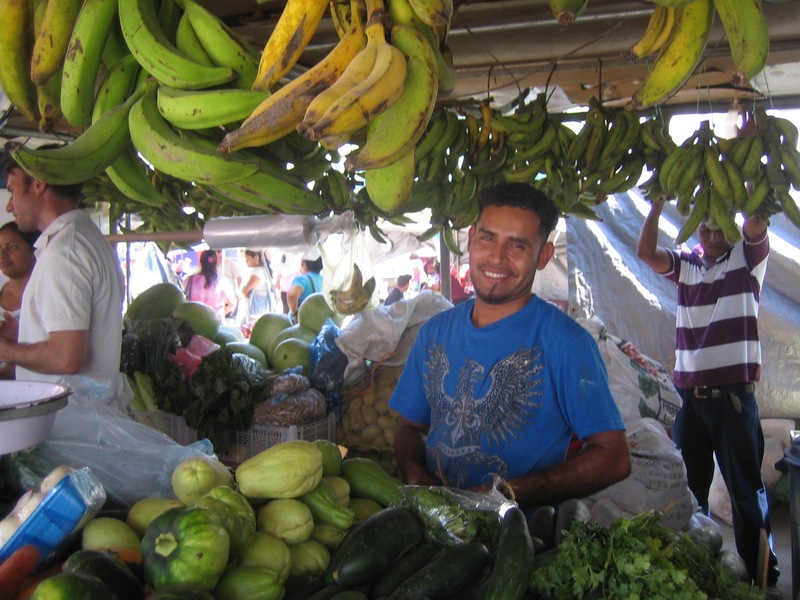 Located on the banks of the Macal River, the San Ignacio Farmers’ Market is a truly wonderful opportunity to experience all walks of Belizean life. We were told to visit the farmer’s market on a Saturday, since that is the day to see it come to life with local farmers selling fresh fruits and vegetables, and vendors selling their creations of jewelry, clothing, and crafts. I personally bartered my way to owning a pink conch shell jewelry set with earrings and a matching necklace. And I couldn’t manage to say no to one of the beautifully unique and finely stitched Belizean handbags. Speaking of treats, the mangos were so perfectly ripened, you thought you were eating something bad for you since they tasted so good.